The Knee Strap from Imak provides targeted pain relief for your knee. 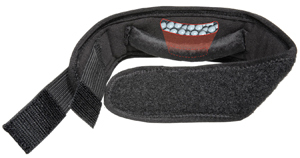 Knee Strap Its ergoBeads Pressure Pad conforms to your knee anatomy to provide focused pressure and maximum support. It also features a Dual Locking system to offer flexible tension and a perfect fit. Use the Knee Strap for relief of tendonitis, chondromalacia, runners and jumpers knee, illiotibal band syndrome, Osgood Schlatter's disease and other knee conditions. Easy To Use. Effective. Stabilizes. Comfortable. Helps me a lot on days that I know I will have to walk more than usual. I have arthritis in both knees &amp; wear one below each knee cap as recommended. Provides good support for the knee, but the ergoBeads Pressure Pad is too hard and puts too much pressure in a small area. If the beads were a bit loose and the Pressure Pad was wider and taller, it would be more effective. Effective. Stabilizes. Easy To Use. Comfortable. I use the product while working out on the elliptical exercise machines. Comfortable. Stabilizes. Effective. Easy To Use. I have used many other knee straps and this one is the best. Very comfortable and not bulky as others and easy to put on. It also does not make you sweat as others do. It does not stay up on the knee, keeps sliding down no matter how tight I make it. If tightened too much the velcro edge starts to "cut" the skin. Not comfortable at all. What size leg does this fit?